A couple of years ago I reviewed Grey Skies Fallen's album Two Way Mirror (read it here), a remarkably enveloping collection of moody prog. I was most impressed by the New Yorkers' sense of songcraft and ability to construct emotionally charged melodies, traits that Two Way Mirror left me eager to hear more of long after the last notes of the final track had faded into the distance. The band is back with Along Came Life, a digitally released EP that seeks to bridge the ambiance of their previous release with the Doom/Death stylings of their earliest days. The band's debut album The Fate of Angels was rooted in the Gothically shaded doom of bands like My Dying Bride and Katatonia, albeit with a budding sense of progressive awareness that demanded further exploration. Almost entirely absent on Two Way Mirror, the band's more aggressive tendencies return on Along Came Life in the form of harsh vocals from frontman Rick Habeeb and gritty, imposing riffs from guitarist Joe D'Angelo. Of the four tracks on the EP, Habeeb growls his way through just two of them ("By the Wayside" and "Forever and a Day"), providing enough of a contrast to his distinctive croon to keep the vocals interesting. That's not to say that Habeeb's clean singing, which comprises the majority of his delivery, is lackluster by any means. I actually prefer his clean style because I think it blends more naturally with the atmosphere put together by D'Angelo's riffs and Craig Rossi's piano. This atmosphere - which will appeal equally to fans of post-rock, doom, and prog - is the bedrock upon which Along Came Life is built, and it's as solid as any Midwestern storm shelter. There's so much variety at work, so many subtle nuances sprinkled throughout the album, that each listen is akin to peeling back a sonic onion to reveal layer after layer of complex rhythms and harmonies. As intricate as the songs are, not one is difficult to digest and all are, in fact, highly infectious and gripping. The pleading leads of "The Grand Scheme of Things", the Tarantino-esque bluesy melody that opens "Forever and a Day", and the mournful seven-minute title track are just the most memorable moments of a very memorable album. 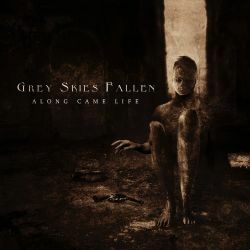 Grey Skies Fallen are an underexposed band that deserve to be mentioned in the same breath as outfits such as Evergrey, Lake of Tears, and Novembre. The appeal of Along Came Life is wide-ranging, making it an ideal vessel with which to familiarize yourself with the band while waiting for their next full-length to hit the streets.